Fund holdings affect fund performance more than fees or past performance. A cheap fund is not necessarily a good fund. A fund that has done well in the past is not likely to do well in the future (e.g. 5-star kiss of death and active management has long history of underperformance). Yet, traditional fund research focuses only on low fees and past performance. Our research on holdings enables investors to find funds with high quality holdings (the best chances for outperformance) – AND – low fees. 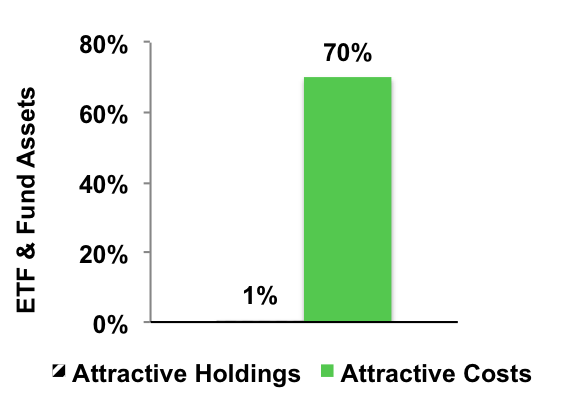 Figure 1 shows that 70% of fund assets are in ETFs and mutual funds with low costs but only 1% of assets are in ETFs and mutual funds with Attractive holdings. This discrepancy is eye opening. Perhaps, if more investors had access to research on fund holdings, they would allocate to more Attractive-or-better rated funds. Figure 2 shows investors are not putting enough money into ETFs and mutual funds with high-quality holdings. Only 78 out of 7209 (1% of assets) ETFs and mutual funds allocate a significant amount of value to quality holdings. 99% of assets are in funds that do not justify their costs and over charge investors for poor portfolio management. Figure 3 shows that Investors successfully find low-cost funds. 70% of assets are held in ETFs and mutual funds that have Attractive-or-better rated total annual costs, our apples-to-apples measure of the all-in cost of investing in any given fund. Out of the 7206 ETFs and mutual funds we cover, 1613 (70%) earn an Attractive-or-better total annual costs rating. First Trust Dow Jones Internet Index Fund (FDN) gets an overall predictive rating of Very Dangerous because no matter how low its fees (0.60%), we expect it to underperform because it holds too many Dangerous-or-worse rated stocks. Low fees cannot boost fund performance. Only good stocks can boost performance. Figure 4 shows that 50% of ETF and mutual fund assets are allocated to funds with low costs and high-quality holdings according to our predictive fund ratings, which are based on the quality of holdings and the all-in costs to investors. Investors deserve forward-looking ETF and mutual fund research that assesses both costs and quality of holdings. For example, Schwab U.S. Large Cap Value ETF (SCHV) has both low costs and quality holdings. We do not know, but we do know that the transparency into the quality of portfolio management provides cover for the ETF and mutual fund industry to continue to over charge investors for poor portfolio management. How else could they get away with selling so many Dangerous-or-worse ETFs and mutual funds?